Photos and stories about the rich history of The Reporter's coverage area. Readers are encouraged to submit their own stories and photos for this blog and the weekly Remember When feature in The Reporter, which runs on Mondays. Contact us by email at citydesk@thereporteronline.com, or write us at 307 Derstine Avenue, Lansdale, PA 19446 for details. You can almost hear this group getting ready to sing, can’t you? This photo was submitted by Hiram Hershey of Upper Salford, the conductor of the Voice Of Youth Chorus shown in this picture. 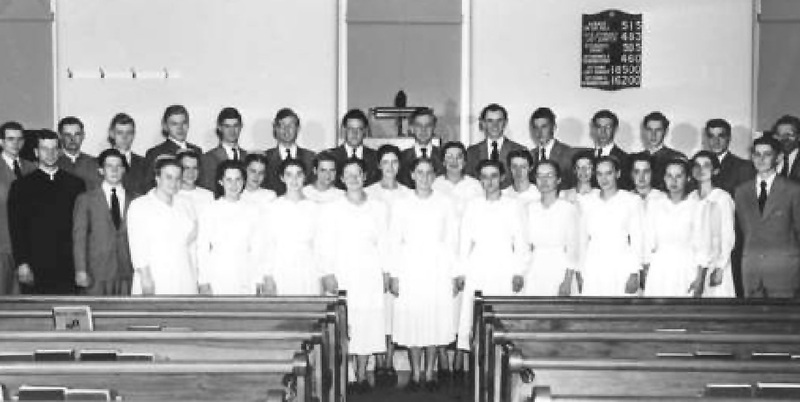 The photo was snapped about 1948, according to Hershey, and was taken at Souderton Mennonite Church. It’s interesting to look at the figures posted on the wall behind this group. If you look closely, you’ll see that there were 515 members on the roll at the time, and “attendance today” had been 505. Attendance a year ago had been 460. And look at the offering -- $185 was collected “ today” and $162 a year ago. Just interested figures to look at, don’t you think?